Barcode creator software is a beneficial application for any industries or organization because of its generating ability of highly customized barcode labels, CD labels, identity cards, diskette label, return address label etc. Barcode creation software easily customizes barcode images in different sizes and caption colour, background colour and font colour. Tool can produce barcode labels, asset tags and stickers with having support to all barcode font standards such as Code 39, Codabar, Code 11, Code 93, POSTNET, UPCA, UPCE, PLANET, UCC128, CODE128, EAN13, EAN8, IND25, Interleaved 2of5 and MSI PLESSEY etc. Freeware barcode scanning software can save barcode image in either Windows Enhanced Metafile format, or in other common graphics formats such as BMP, JPEG and GIF. Barcode builder program can print quality customizable barcode labels that can be easily printed using Thermal and Barcode Printers or Normal Printers. Bar code and label software is compatible with all windows operating systems such as XP, 98, NT, ME, 2000 and 2003 server and Windows Vista. Barcode images creator utility generates labels which can be used in several inventory packaging, shipping, price marketing and tracking etc. 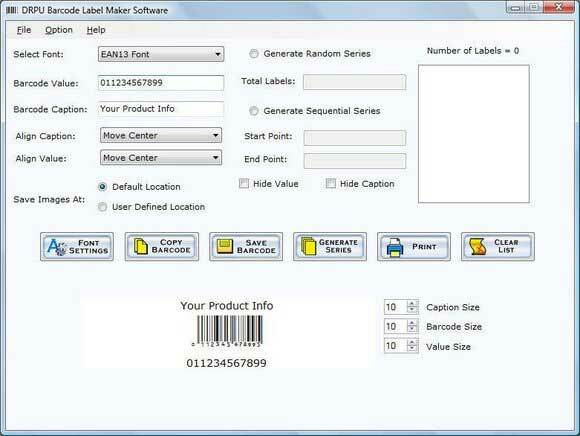 Features: * Download quick and convenient software solution for creating fully customizable barcode image labels. *Tool can directly copy barcode image to word processing software or image editing software and save generated result into several commonly used file formats. *Barcode builder software supports most popular code style such as code 39, EAN-13, EAN-8, UPC-A etc. *Software can maximize benefits of several industries by reducing workload of unwanted data entry. *Utility is available with highly graphical user interface, so it can easily be used by technical as well as non technical users.